조사본 ｢유가사지론｣은 唐의 玄奘이 한역한 100권 중의 제20권이다. 권말의 “丙午歳高麗國大藏都監奉/勅雕造”라는 간기(刊記)로 볼 때 고려 고종 33년(1246, 丙午)에 대장도감(大藏都監)에서 판각한 재조대장경의 판본으로, 13～14세기경에 인출하여 권자본(巻子本)으로 장정한 후인본(後印本)으로 추정된다. 조사본은 비록 권수(巻首)의 제1장이 결락되고 제2～3장이 훼손되어 있으나 13～14세기경에 인출해낸 고려 재조대장경의 판본으로서 중요하며, 특히 각장 각행의 좌우에 석독구결(釋讀口訣)이 필사되어 있어 국어사 연구에 매우 귀중한 자료로 판단된다. 따라서 국가문화재로 지정하여 연구하고 보존·관리할 만한 가치가 있는 것으로 판단된다. This book, Yogacarabhumi Sastra (Discourse on the Stages of Yogic Practice), is the twentieth of the one hundred fascicles constituting the sutra that was translated into Chinese by a Tang monk Xuanzang (c. 602–664). Although the first chapter has been lost and the second and third chapters are damaged, it is still generally regarded as an important part of the Korean cultural heritage as a copy of the Second Tripitaka Koreana Edition printed in the thirteenth and fourteenth centuries. 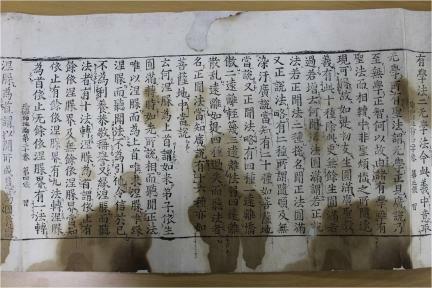 The book is also regarded as an important source of knowledge on the Korean language of the medieval period due to use of the seokdok gugyeol (""interpretive glossing"") technique throughout its text. As such, it merits designation as a national heritage and should be preserved and studied in a systematic manner.